4. Let’s look at what we’ve got! 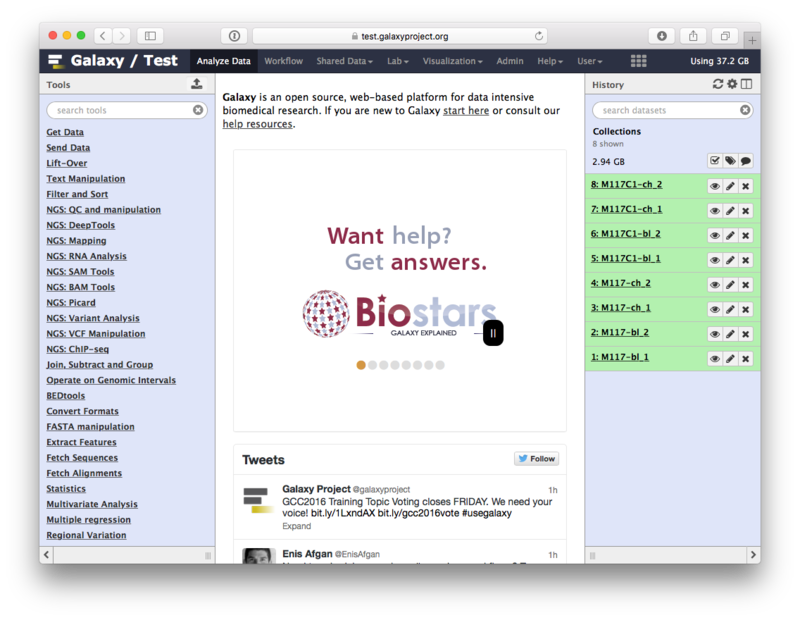 Here we will show Galaxy features designed to help with the analysis of large numbers of samples. When you have just a few samples - clicking through them is easy. But once you’ve got hundreds - it becomes very annoying. 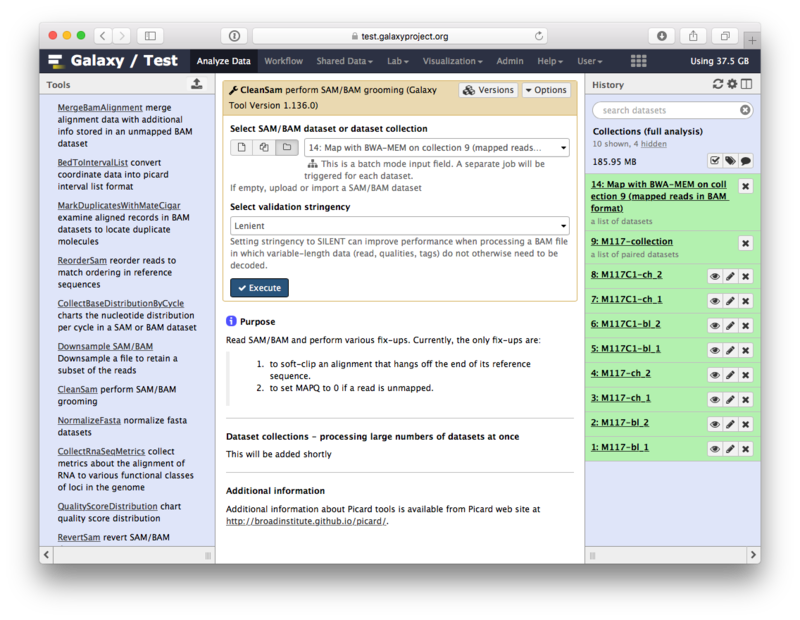 In Galaxy we have introduced Dataset collections that allow you to combine numerous datasets in a single entity that can be easily manipulated. you have your browser configured as described here. 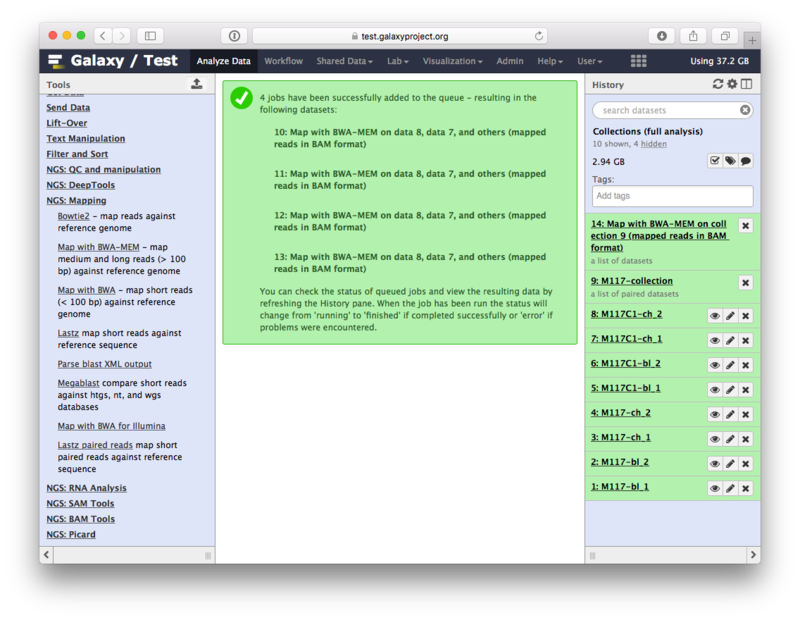 warning At this time this tutorial is using Galaxy’s test server at https://test.galaxyproject.org. Once the main site is updated this tutorial will be edited. These datasets represent genomic DNA (enriched for mitochondria via a long range PCR) isolated from blood and cheek (buccal swab) of mother (M117) and her child (M117C1) that was sequenced on an Illumina miSeq machine as paired-read library (250-bp reads; see our 2014 manuscript for Methods). and create the collection by clicking Create list. A new item will appear in the history as you can see on the panel A below. 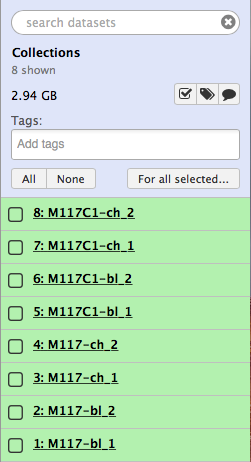 Clicking on collection will expand it to show four pairs it contains (panel B). 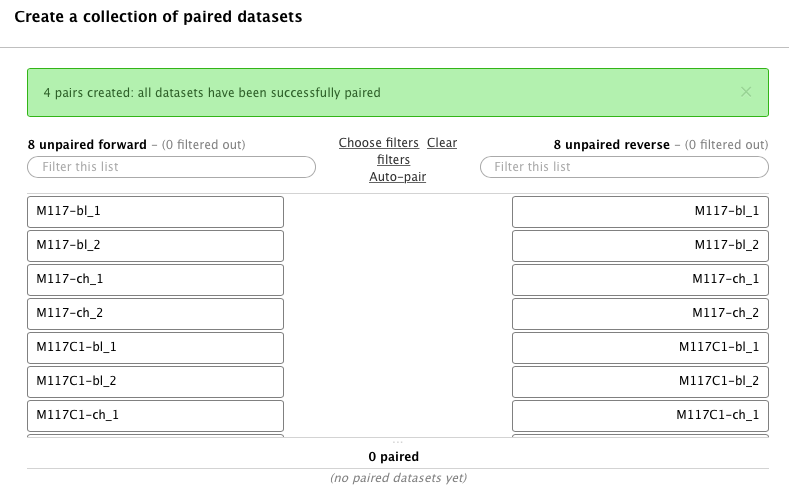 Clicking individual pairs will expand them further to reveal forward and reverse datasets (panel C). 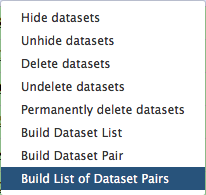 Expanding these further will enable one to see individual datasets (panel D). scroll down and click Execute. Let’s look at this collection by clicking on it (panel A in the figure below). You can see that now this collection is no longer paired (compared to the collection we created in the beginning of this tutorial). 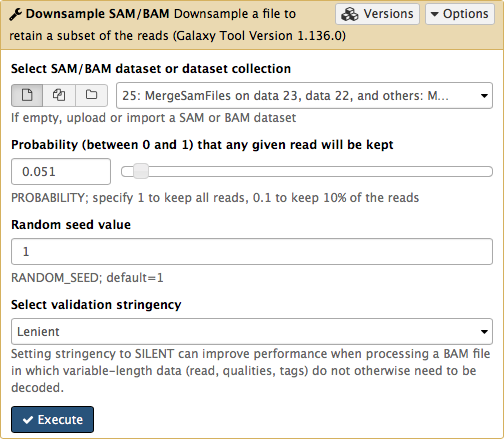 This is because bwa-mem takes forward and reverse data as input, but produces only a single BAM dataset as the output. 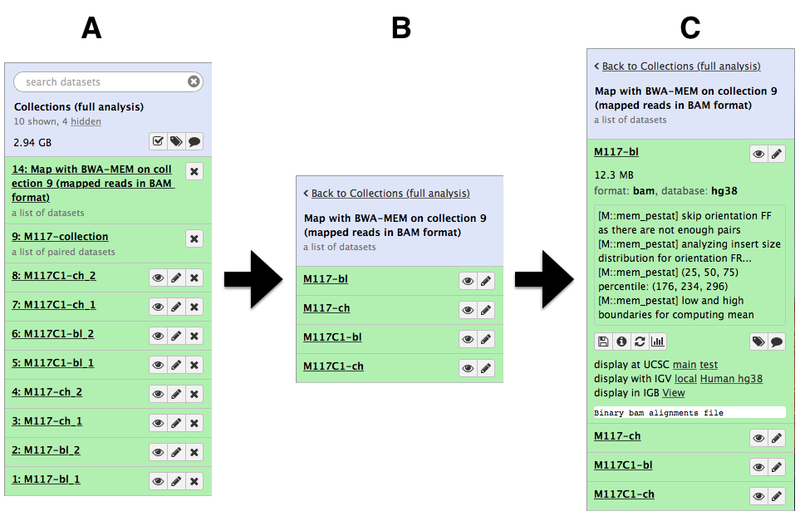 So what we have in the result is a list of four dataset (BAM files; panels B and C). 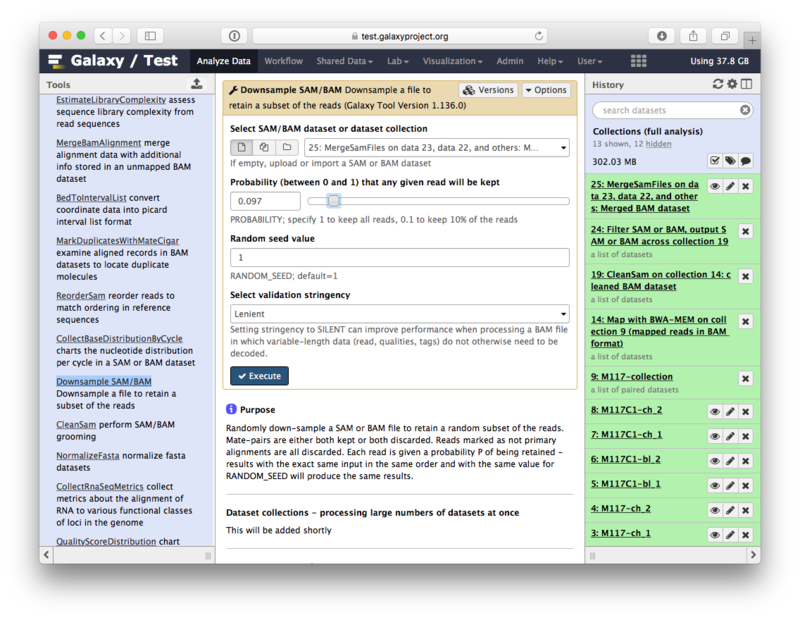 Now that bwa-mem has finished and generated a collection of BAM datasets we can continue to analyze the entire collection as a single Galaxy ‘item’. Click Execute. 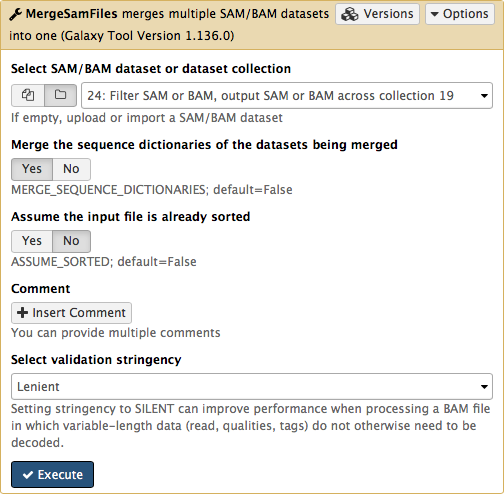 As an output this tool will produce a collection contained cleaned data. parameters should be set as shown below. 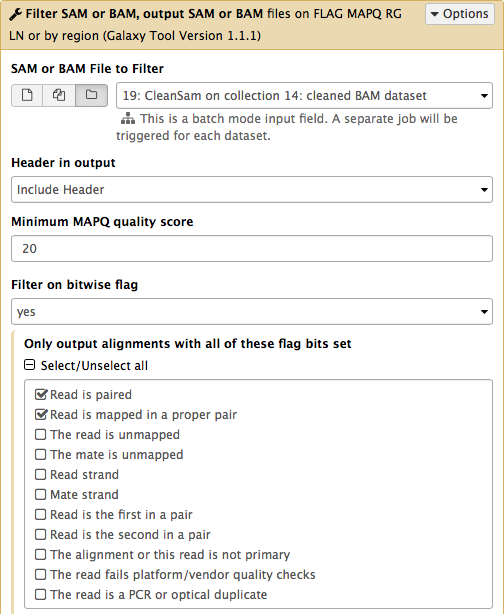 By setting mapping quality to 20 we avoid reads mapping to multiple locations and by using Filter on bitwise flag option we ensure that the resulting dataset will contain only properly paired reads. 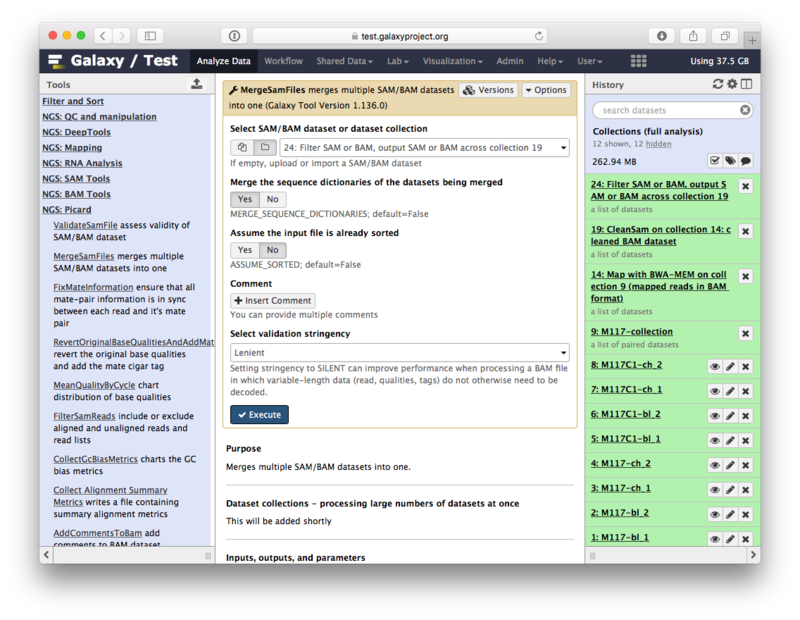 This operation will produce yet another collection containing now filtered datasets. This operation will not generate a collection. 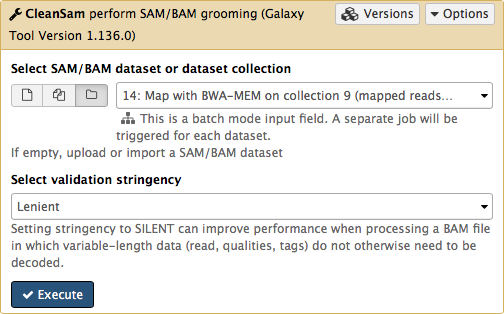 Instead, it will generate a single BAM dataset containing mapped reads from our four samples (M117-bl, M117-ch, M117C1-bl, and M117C1-ch). 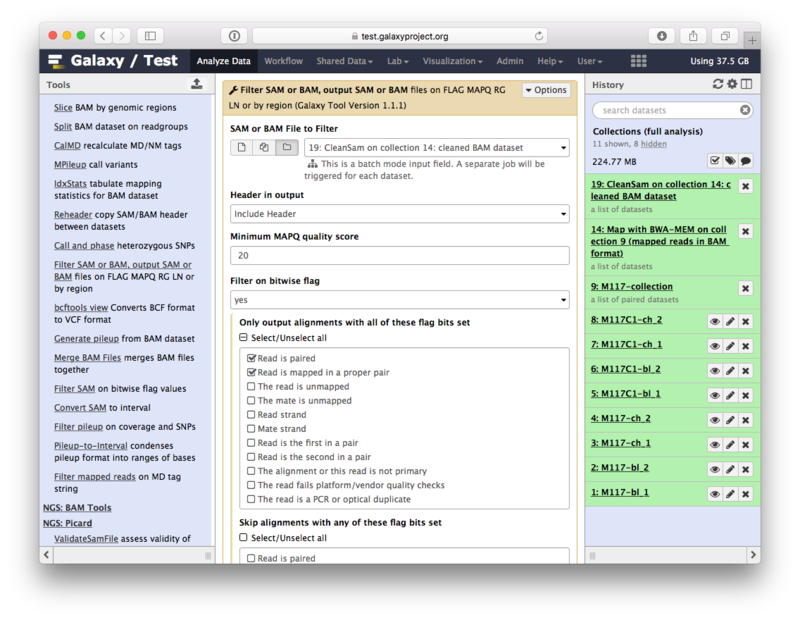 Click the Human hg38 link in the display with IGV line as highlighted above (learn more about displaying Galaxy data in IGV with this movie). 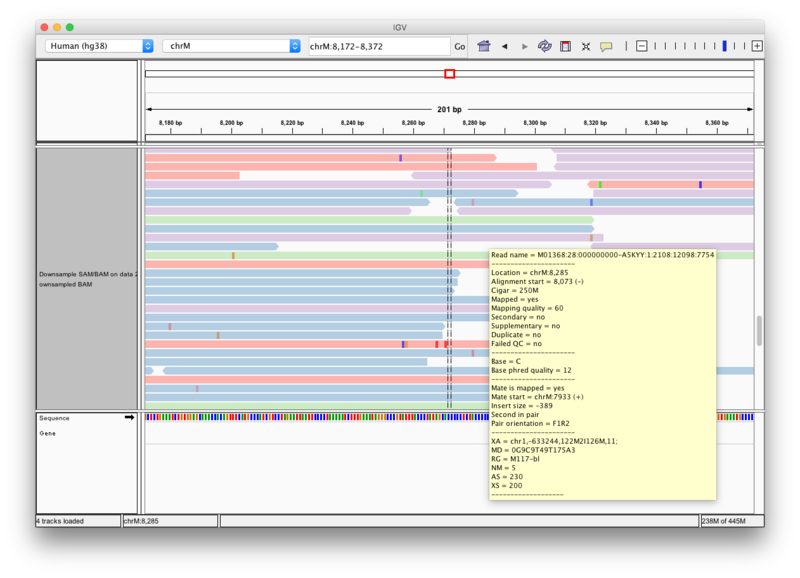 Below is an example generated with IGV on these data. 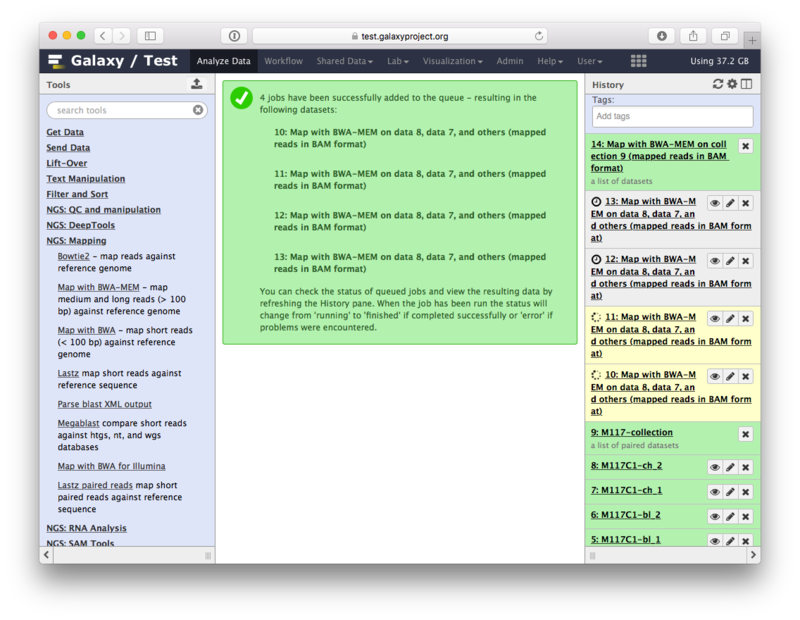 In this screenshot reads are colored by read group (four distinct colors). A yellow inset displays additional information about a single read. One can see that this read corresponds to read group M117-bl. 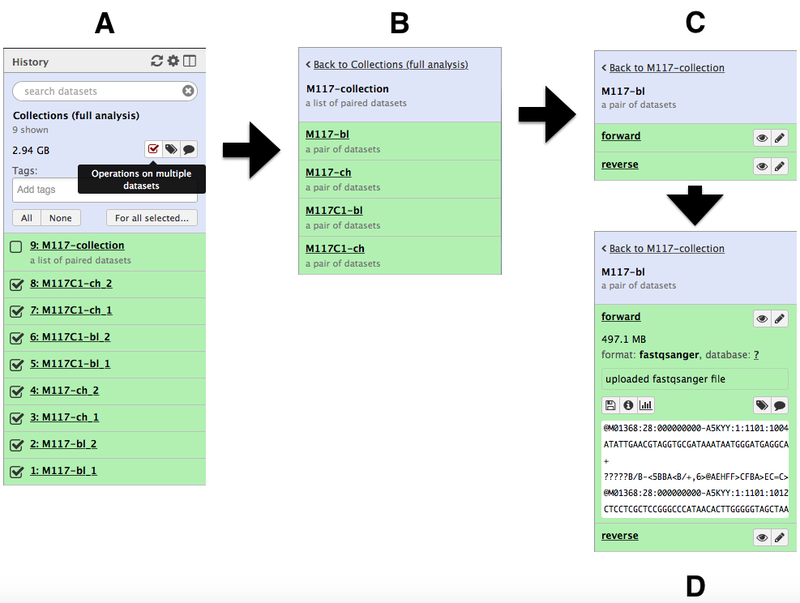 From there you can import histories to make them your own. …you need to complain. Use Galaxy’s Help Channel to do this. This material is the result of a collaborative work. 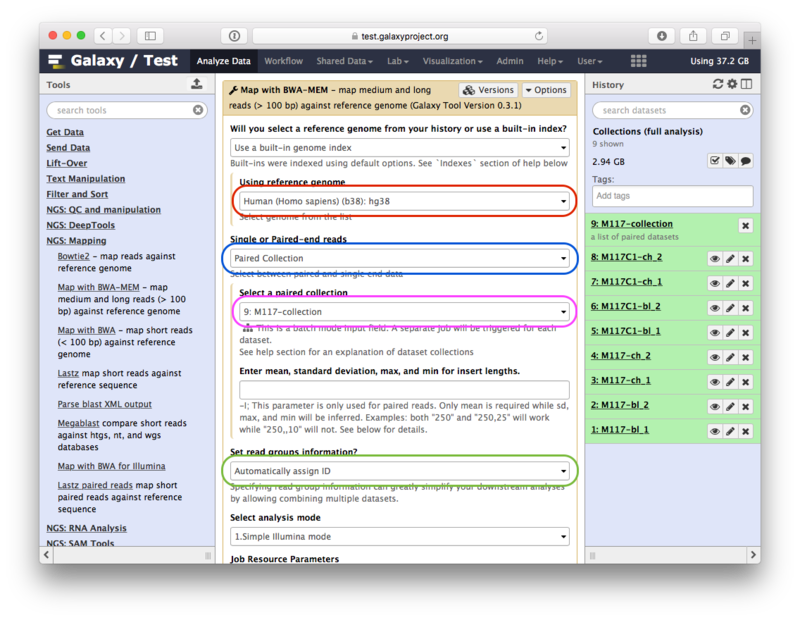 Thanks to the Galaxy Training Network and all the contributors ( Anton Nekrutenko, Anne Pajon)!